Please read through the Q&A before posting a question. This will help everyone to not have duplicate questions. Thank you! ask your question in the comments section below. Can a driver with lung disease get a DOT medical card? Is the use of oxygen therapy a disqualifier? I was recently diagnosed with COPD from exhaust leak in my semi. Can I lose my CDL because of this diagnosis? Can I still drive if I have a blood clot in the lung? I had lung surgery and a lobectomy a few years ago . Will this fail me on a DOT physical? What does neck size, weight, and BMI have to do with the DOT physical exam? What does snoring have to do with the DOT physical exam? The medical examiner will evaluate your condition to determine how the lung disease may affect your ability to safely drive and perform other duties of a commercial driver. If you don’t have a medical opinion letter from a treating physician, you may need to go for a chest x-ray or pulmonary function tests before the medical examiner can consider certification. Most likely, yes, oxygen therapy while driving is a disqualifier. The reasons are twofold: 1. Malfunction of the oxygen equipment. 2. Progression of the disease may be debilitating. You may be considered if you can pass a pulmonary function test. The diagnosis of COPD is not, by itself a disqualifier for your cdl. It will/may have an effect while doing your medical examination and certification. Your best bet is to take any and all notation from your primary lung doctor with you when you re-do your medical exam and certificate. The examiner just needs to make sure your are fit to return to work without being a risk to yourself or the public at large. With the blood clot in the lung, you want to make sure you bring a note from you pulmonary specialist stating you are good to go. The medical examiner will need a copy for your file when he does the exam. In and of itself, the lobectomy should not be an issue. But what was the reasoning behind the surgery? Your examiner will have other questions regarding the surgery and what its long term effects are, as well as, how it affects your ability to operate a commercial motor vehicle. Neck size, weight, and BMI are all just indicators that the medical examiner looks at to determine if you may have a condition that would impact your ability to safely drive a commercial vehicle now or for the period for which the medical card may be issued. There are currently no set specifics on these measurements in the DOT regulations. However, companies may set their own policies and have their own standards for these indicators, which may disqualify you to drive for that particular company. Snoring, in combination with obesity, can be highly predictive of obstructive sleep apnea risk. That said, even the loudest of snorers may not have a breathing obstruction. The sign that is most suggestive of sleep apnea occurs when snoring stops. If both snoring and breathing stop while the person’s chest and body try to breathe, that is literally a description of an event called an ‘apnea’. When breathing starts again, there is typically a deep gasp and then the resumption of snoring. For the DOT physical exam the medical examiner evaluates your overall physical condition and health history to determine if there are signs of a medical condition that may affect your ability to safely drive a CMV. If the medical examiner has reasonable suspicion that you have sleep apnea you may have to go for an overnight sleep test called a polysomnogram before you can be further considered for certification. Can’t Find An Answer For Your Question? If you have a question that you feel has not been answered, scroll down to the Questions and Comments box and post your question. Before posting, please make sure you are on the appropriate Category page, so that relevant questions and answers can be found by other drivers too. To save us all from zombie spammers, your question will not appear on this page until it has been approved. Trucker Docs™ will answer your question as soon as possible. Visit this page again soon to see our response. P.S. Your email address will not be published. Your comments are also welcome. The condition is going to raise questions and will require your most recent test results. Be as prepared as possible with medical release forms, without restrictions, and medical documentation. He really needs to determine the cause of his condition. Then he could determine how to treat it, correctly. Can a driver be certified with a tracheostomy? It is going to raise questions from the examiner. Be prepared with documentation and medical releases prior to the DOT examination. You are going to need medical releases and doctors documentation from this point on. Your condition is going to present with plenty of questions from any CME/DOT examiner, so be prepared. You need to check with disability for the best answer. Even with state variances for school bus drivers, you may have difficulty passing the medical certification examination. Hi, I was shot in a robbery 2 years ago.. I had a collapsed lung and injured diaphragm. I completed a long function test and the result was I have 87% lung capacity on my right lung and 100% on my left lung… Will I be able to get Dr.s permission to drive a cmv? Get a medical release form from your treating physician, with no limitations, and you should be good to go. I was just told by my pulmonologist, after reviewing my recent sleep study, that he wants me to use oxygen while sleeping in addition to my cpap. Is this disqualifying if using ir only while sleeping? It is going to require additional information and documentation from your doctor. The CME will have questions and will need copies of your test results, before he will make any decisions. Your COPD is going to raise questions, so be prepared to provide supporting documentation and a medical release form from your doctors. Less than 30 the put you on lung transplant list. Hello, I have sleep Apnea and a CPAP machine. I’ve been off the road for 5 years now, I wish to drive locally. I have a Class A. I also wear hearing aids as well. Is there any hope for a guy like me? Plenty of hope for you. If you had a sleep study done just last year, then you should not have to re-do the whole sleep thing again. Also, you are a class B driver being held as a class A examination? The examiner is going to need a 30 day readout, so the best you can do is start using the machine asap and hold on getting the new medical card examination until you can provide the needed documentation. If a driver has a condition that requires a PICC line connected to a pump, is he still allowed to keep his CDL and drive bus? School bus, tour bus, nursing home bus, would all fall under the states variances and your best answer will come from them. Hi my friend was diagnosed with lung cancer he has completed chemo and the mass is reduced by more than half. He has no respiratory issues at all. It was just noted on a chest X-ray. If he can pass the DOT medical certification examination and supplies the CME with the proper medical release and documentation, then he should be good to go. Pass as far as what test? Or examination ? Pulmonary function test?????? The DOT medical certification for commercial drivers. He may also be required to provide a copy of his last pulmonary function test. It becomes more of an issue when you start losing feeling in your hands. Numb hands on the wheel do not give you good feedback as to what else may be happening with the vehicle. Outside the DOT you may want to find a doctor that does ART (active release technique) in your area to determine if they can help with your situation. I am 39 years old with Hypothyroidism as my only health history in which I go to my family doctor every 6 months for a prescription and to monitor blood work. I am over all very healthy and fit. I went in for a medical exam yesterday they would not pass me because they said my urine showed a urinary tract infection went back today no sign of UTI, but now say since I am a smoker over 35 I have to pay out of pocket to have a lung capacity test. I have never had breathing problems of any kind. Is this really something I have to have done? It is a recommendation from the FMCSA, but should have some supporting evidence before making that request. Go get a second opinion from another DOT examiner. I use prescription oxygen when not at rest. When at rest, includes while driving I am able to maintain 92%-97%SpO2. I keep a generator with me so during hook up and stops at rest areas or any other non driving duties I am able to keep my SpO2 % in the 90’s. So if I do not use supplemental O2 while driving am I legal. Class B pulling vacation trailers. As an interstate driver you would have to explain to the examiner what your job entails and the amount of hours that you drive. You are class B, but hauling interstate, so make sure you have a medical release form from your doctor explaining your situation and have that in hand when you go for your DOT examination. The information helps the examiner make a more informed decision. My significant other uses a CPAP machine regularly for sleep Apnea. When he needs the card read for his DOT physical in Wisconsin. I was wondering does it have to be read by someone official or can I print off the reports using the sleepyhead website, which are the same reports that gets printed off when we take the card into someone? As long as the report is less than 30 days old, then you should be able to simply pull the report and print it for him to take into the examiners office. I’ve had both a traumatic and a spontaneous Pneumothorax that required surgery. I’d like to obtain my Class A CDL as a plan B career plan. Is the history of a spontaneous lung collapse a problem? It will raise questions by the medical examiner so make sure you have a medical release form from your primary physician and your pulmonary specialist. The medical examiner may request a recent pulmonary test. What kind of truck driving? Intrastate? You would not qualify as a Class A interstate driver. Workers comp doctors say it’s ok to go back to work…..
No you will not pass a DOT physical with a collapsed lung and labored breathing. Hi there! I had a tracheotomy done in 2010 due to having fluid in my lungs and problems intubating me. I’m wanting to try and get back into driving and getting my CDL and I would need to get my DOT physical done. Would having the trach disqualify me from passing the physical, my pulmonary doctor is running tests now to make sure everything is fine and she sees no problem with me going back to work driving. I don’t see anything that says that it’s a disqualifier. With proper documentation and recent testing results you may be able to drive intra-state, but suspect that you would not be qualified as an over the road interstate drivers. Make sure that you have as much available information and documentation as possible. Are there new regulations regarding oxygen use in a truck? I am being treated for copd and require oxygen in the truck. My question is if it is provided by an oxigenator is that ok? Keep in mind oxygen tanks will not be used. COPD will be an issue that will need to be addressed by your primary care doctor. Have your pcp fill out a medical release form explaining your condition and the need for the oxygenator. The CME will make a final decision based on all medical documentation. I have asthma and have had it under control for 16 years. Yet, each year I am told that I have to have a PFT preformed in order to issued a one certification. I am in Mississippi. I can not find anywhere were it states the requirements for asthma, please advise. The CME is looking at the potential risk of an attack and so he is ordering the test. It is not a standard requirement, but the CME’s call, if he wants it. You could try a medical release form from your doctor explaining your condition and that you have it fully under control. Documentation is what he wants to cover his decision making process. Can a person that is on oxygen pass the DOT physical to be a school bus driver? This will depend on your State’s variances. Contact your local drivers license to get the details. In the state of Tennessee is a driver required to take a breathing exam if they have smoked cigarettes for many years…I have never heard of this before when renewing in other states. The CME can request one if he feels that there may be a safety issue. And if he wants to do that test in his own office, then it is up to you whether you want them to do it or you can go to your primary doctor and have your doctor do it. It is not the CME’S duty to perform other tests. His job is to determine medical fitness for duty, period. Last year I had a lump removed from my neck, that was diagnosed as Cancerous. I had 35 Radiation Treatments, and 4 Chemo sessions. I have had several scans since then, and have been declared Cancer Free. since released by my doctors. 20% Body fat, currently no known health problems at all, and probably in the best shape of my life…and I was an athlete in school, and I’m MUCH stronger now…. Would the Cancer that I HAD effect my ability to get a CDL, and a job driving a truck now? I have COPD and recently went through an exacerbation due to smoldering battery fumes leaking into my bus . I went to the ER and got IV steroids and a breathing treatment. Also went to my pulmonary spec and had a pulmonary function test. The results were that I needed to have 1 L of oxygen only while ambulating.. since I don’t need it while driving can I still drive interstate? They have an employee that had a CDL exam with no physical abnormalities documented, other than being overweight, who received a 2 year certification (expires 2018). Since then, the employer has identified work habits that they feel indicate some kind of sleep disorder… the employee is frequently late, has been found napping in their vehicle and has complained to another coworker of feeling drowsy during the daytime. The employer has spoken to the employee about their suspicious behavior and recommended to the employee they have a sleep study conducted. The employee denies any sleep disturbances and is resistive to pursuing any sleep studies. I know the FMCSA does not have any hard fast rules requiring sleep studies. My question is… Can an employer mandate an employee to have a sleep study or seek a medical evaluation based on suspicion of OSA when the employee has already been evaluated and has a valid CDL that’s not expiring for another year? I guess the employer is saying…it’s no different than sending an employee for a drug screen for suspicious behavior. The question then becomes…if the employer does not have these rules/regulations in their job description/handbook, can they legally require an employee seek medical attention based on observed behavior? We would say, from a safety issue, if the company feels that the driver has a potential safety concern then they have the right to request an evaluation. If the request is not fulfilled, then the company may have the right to dismiss the driver due to non-compliance regarding the safety issues. This one won’t be found in the FMCSA guides, but is more about the company and their safety requirements. 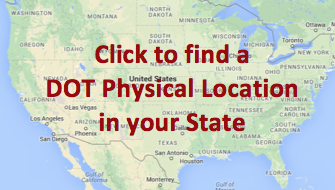 You can go to any examiner, in any state, as long as the examiner is certified by NRCME/FMCSA to do DOT medical exams. Each examiner who is certified has a National Registry #. As long as you have a medical release form from your doctors, then, if everything else is normal, you should be able to get a new medical card and get back on the road. I recently have taken a dot physical and my bmi was to high so they gave me a 3 month card and said i need to get a sleep apnia test done. I had the test done and it came back negative but it said that hypoxia was present. What does that mean for renewing my cert. Hypoxia is a condition in which the body or a region of the body is deprived of adequate oxygen supply at the tissue level. This should be followed up with a visit to your primary doctor to make further determinations as to the direction this needs to go. Once the situation has been resolved, then have your doctor complete a medical release form for you and you should be good to go from there, if everything else is normal. I was diagnosed with copd. FEV is 49. Arterial blood gas test was 95.7. I have a medical release from my pulmonologist; condition is stable. I am not having any symptoms- no shortness of breath, not using a rescue inhaler. Will this disqualify me from retaining my CDL? FMCSA is looking for a 65% or better FEV. If you can have your doctor sign off on a medical release form for you and have him explain what his findings reveal, along with a working prognosis, then you have a better chance with the CME. All available information present at the time of the DOT examination is a huge help to the CME to make the best decision. I recently fell and suffered a partial pneumothorax. My lung reinfloated within 2 days. Does DOT have a length of time I have to wait before I can drive a cmv? Your fall and subsequent injury invalidated your medical card. As soon as you can get a new medical examination and demonstrate fit for duty status to the CME, you are good to go. I live in Miami but used to drive over the road. I keep up my CDL every 2 yrs. In the past 2 yrs I’ve had 2 very bad asthma attacks, one of which I had to be hospitalized. Now it’s under control, but I can still have a minor attack. Will getting a handicap sticker to park closer to buildings affect my over the road CDL? Not if you can continue to pass the FMCSA guideline requirements for the DOT medical certificate. I had my lung collapse 8 yrs ago due to smoking. Since then I dont smoke and I’ve had no problems out of it since. Will they fail me because of it. No, but to be ahead of the game have your primary doctor fill out a medical release form for you explaining that you have had no issues with your lungs for many years. I had my thyroid remove 2 years ago due to cancer. I only use levotyroxine 200 MCG a day to replace my thyroid function. I don’t have any impairment to drive a motor vehicle. Do you now if this would be a problem to obtain my DOT medical card? Just make sure you take a medical release form from your primary physician explaining your situation and medication usage, after that you should be fine. I was told that a large mass was found in my chest during a cat scan, I have also started to pass out sometimes when I cough, told I had moderate copd. I’m fairly sure my cdl days are over if I understand the law right. As these can have an effect on the safe operation of a commerical vehicle? Correct, you are starting to have issues that will effect safety. Once the surgeries are complete and you are fully recovered, you want to have a medical release form from your doctors. Have them explain your medication needs and reactions, if any, to the meds. If everything works out you should be in pretty good shape as a crane operator. I have cope I’m on prescription inhalers and alprazolam .25mg for a touch of anxiety. I passed all other requirements of DOT physical except my blood oxygen level was at 90. I have a oxywatch at home meter I check out at normal (for me) at 90-93. Dr. Failed me for DOT. What is acceptable(passing) level for person with copd? Thank you. Considering that normal is 95 to 100, then the CME may be looking for another confirmation from your primary doctor. Try getting a medical release form from your doctor explaining your condition and situation. If your doctor will sign off and all else is normal, then the CME can and will take all of the available information into consideration regarding your medical certificate. My friend has COPD and is on medication and inhaler to help sometimes, the examiner made him take respiratory test and he didn’t have good enough score. His primary who is DOT examiner In another state says he is fine and he would pass him.. He is totally healthy otherwise.. What can he do to pass? Go to the primary doctor that is DOT qualified and take the test. My husband has copd, just had a flare and had a medication round he has completed and been released by his doctor. What are the minimum requirements with a lung test to continue to drive if his company requests further testing? If your hubby had a flair up and was placed on medications and then had to be released to return to work duty, he will most likely, need a new medical certificate to determine a fit for duty status. Just make sure he has a medical release form from the doctor with a copy of his last pulmonary testing results. That should be all you need. Yes. Any situation that takes a driver from behind the wheel has to be re-certified as fit for duty. With all of the new restrictions that are disqualifying CDL drivers, are they able to go on disability? It seems like a lot of people are losing their ability to work. I’ve been a SC school bus driver for 8 yrs now and had Lung reduction surgery 9 years ago and now have begun using oxygen at night, but with the new regulations I probably won’t be allowed to continue because of my pft’s. I’m wondering what my options will be. You really need to check with your state drivers license department on this one. You are asking a question about over-the-road long haul drivers medical certificates and you drive a school bus locally. Not the same thing. DLD should be able to answer your questions the best. I only drive the school bus so you’re probably right in contacting the state. Thanks for the information. Check with your state drivers license department, this is a state related question, not fed. question. Some states will just downgrade your license and some states cancel your entire drivers license, so you need to confirm which is true in your state. Get a medical release form from your lung doctor along with an explanation of your situation. That will be the best thing you can do right up front. The more information that the CME has to make a decision, the better your chances are. I’ve was diagnosed with sleep apnea in 2011. I worked as a automotive tech. In Nov 2015 I got my cdl’s. I went to training with a company and had to take a physical and indicated on the long form that I had sleep apnea. They said I need a complaince letter. What is the complaince letter and where do I get it from. Your cpap machine should give you a readout indicating how often you use the unit. FMCSA want to see 70% compliance at four hours a day for at least 30 + days. Talk with your sleep doctor and have him do a print out for you. I recently failed my IDT physical because I use Albuterol more than twice a week because of allergies and asthma. I take Asmanex at night, both of which have been prescribed by VA. Is asthma really considered “out-of-control” if used over twice a month? If your condition is under control with your medications and an emergency inhaler, then you should be fine. The safety issue would be that you would go into a coughing spell and not be able to maintain control of the vehicle. Try getting a medical release form from your doctor at the VA explaining your condition and your medications with the use of the inhaler and you should not have any major issues. If his primary doctor finds that your hubby can pass the breathing test in his office, then he can fill out a medical release form and take it back to the CME. That should satisfy the CME. My husband just went in for his dot/cdl physical in NY state. The Doctor said he looks great, super healthy but because he is a smoker is requiring a lung test. He has no issues and the dr wasn’t concerned about any health issues. Is this a normal requirement now if you’re a smoker? Only if the CME wants to do the test. If there were no other issues, then he may be over-reading the guidelines. You can question the CME opinion and if there is no good reasoning for wanting the test, then ask him to change his opinion. I was just in the er this last week. I had asthma attacks and had to be put on a breathing treatment for an hour an a half. I’m on antibiotics and also steroids along with allergy medicine. I gave a nebulizer and have to use it every 6 hours. I have my medical card already. But my question is that, what are the rules and regulations on using breathing treatments such as a nebulizer? As long as you can keep your condition under full control, then the FMCSA guidelines for fit for duty are met. But make sure that you have an emergency inhaler available at all times. You may be subject to a pulmonary evaluation considering you have an active asthma condition. Remember it’s about safety for you and the public at large around you. So the CME may request the study. Also make sure you have a medical release form from your doctor stating that your condition is under control. Page 108 of the FMCSA guidelines recommends a 3 months wait following an embolism. Even though your primary doctors have released him, FMCSA feels that the three month wait is necessity, due to safety issues. Can a School bus driver be disqualified from driving if they have frequent anxiety attacks? Are these attacks being treated or not? not much to go on here and the safety of the children is the main issue at this point. This is an ongoing progressive condition and should be watched very closely. A lot will depend on what your oncologist has say about the rate of progression. Start with a medical release form from your oncologist. And be honest with yourself as to whether you feel that you could be classed as medically fit for duty to perform the duties of a commercial motor vehicle operator. My husband went for his DOT physical and the doctor measured his neck and it was all down hill from there. He just had his thyroid removed June 2nd 2015 so his neck could still be swollen. She would not let him answer any of her questions she asked him she answered herself and just kept saying oh I know the answer. His neck measured 19 inches and she said you need a sleep study done, a stress test test done and yelled at him because his doctor had him on potassium medicine and that produced protein in his urine. So she is only extending his medical card for 3 moths and all these test must be completed. She never even asked him he he has trouble breathing or anything. Never gave him a chance to talk. Is all this necessary for a medical card? Your A1C levels are too high. You will have to bring those levels down before you will pass the DOT medical certification process. Not much to go on here, I would need some more information to try to answer this question. When was the surgery, why did you have the surgery, is there any difficulty breathing now? … etc. My husband has a pretty nasty cold. As a truck driver what otc meds can he take? He is currently at home for the next 10 days for vacation. Is there anything otc that will not cause a positive random drug test? His company does hair follicle testing. You really need to check with your primary healthcare provider for this answer. I AM DEALING WITH A RT SIDE PARALIZED LUNG, DEMINISHED BREATHING AND WEAKNESS. I AMTRYING TO FIND OUT IF THIS CONDITION WILL DISQUALIFY ME FROM RETAINING MY CA. CDL LICENSE. E-RAY SHOWS DIAFRAM TOTALY CALAPSING RT LUNG TO A THIRD OF SIZE WITH NO MOVEMENT , THIS HAS BEEN CONFORMED WITH CAT SCAN. As an OTR driver you are going to be disqualified. You need to check into driving intra-state only. By doing that the state may allow you to continue driving within the state borders. But, you will need to confirm that with your state drivers license department. I am a female driver. My neck measure is right @ 16″. Good right? I am 50 lbs overweight. Will my weight disqualify of limit my dot physical time to less than 2 years? There are no laws regarding neck size and weight. So if someone starts in with this issue, get up and walk out. To better understand the confusion on sleep apnea screening, read this set of sleep apnea articles on our blog. My husband has a sebaceous cyst on the back of his neck. He recently left the Air Force and was told it was nothing to worry about. Would this be a problem passing a DOT physical? Not unless it causes restrictions to his movement or could cause any limitations in the safe operation of a commercial motor vehicle. There are plenty of drivers with these cysts and no one has had any problems. All he will need to do is explain what it is and he should be good to go. my husband went to renew his medical cert.. and was told he couldn’t renew because he used oxygen. he uses his oxygen only at night when he sleeps, and it is a low dosage of 3.5. his oxygen level is good during the daytime. can he pass the exam and get his cdl back? Any CME is going to have questions. Have his primary care physician fill out a medical release form for you, answering the questions of usage and the need for the oxygen usage. I am a compliance manager and have a driver who just had a pft test done and is a smoker. This is the first one I have seen and we have about 30 drivers.I was not aware that this was a requirement. If so, can you tell me where to find this in the guidelines and/or is it just if the doctor is anticipating a problem later down the road. It is not a requirement, it is a recommendation within the guideline if the driver presents with possible lung related symptoms. The CME may be being very careful, but it is not his position to perform such a test. It should be referred to the driver’s primary doctor for further testing. What does the breathing, or pulmonary test consist of? Hearing of percentage numbers. Percentage of what? When a DOT driver is tested and it also includes a respirator test – is the respirator test good for the two years like the DOT or only one year? In most cases test results are good for two years, unless the examiner is seeing other signs that would warrant additional testing. I recently had my card renewed. And the examiner told me that because I was 55and had smoked that I was required to take a pulmonary test .Is this a requirement? I was told I would have to take it before he even listened to my lungs. Was everything done according to fmcsa regulations ?Or did I have to pay 80 dollars for b.s.? This test is a guideline recommendation, but not a regulation. Not sure why they would have required this test, unless there was good reason to do so. If I have cancer & I am taking keemo treatments can I still pass my DOT physical ? At present you are not medically fit to operate a commercial motor vehicle. Once your treatment is complete and you are ready to return to driving then you will go through the CME medical examination to make the final determination. dot says i need a pulmonary test,my doctor says i dont need one can i get a x-ray to pass to drive a min school bus,i have been driving for a year now. Have your doctor fill out a medical release form stating that his examination supports a no-need for testing opinion. The CME is trying to cover his behind because he was taught that certain folks “have to have” certain tests. Everyone is looking for safety and trying to support their opinions. I have Cystic Finrosis but my fev1 is 86% can I pass the dot and will they allow me to do my breathing percussion treatments on the truck while not driving? Any CME is going to have a lot of questions with this condition. It is not a disqualifier, but there are safety concerns. Get your medical doctor to complete your medical release form explaining your situation and you should be OK.
Also check with the company that you are going to be driving for. They may have some safety concerns too. My husband operates a public transit bus in California. He has just been diagnosed with emphysema (early stage) and he is coming up on time to renew his medical card. Does this disqualify him? If not, what does he need to renew his medical card? Have his primary doctor complete a medical release form for him. is it required to got a new physical becases you have a small hurnia repaired?per dot. If the hernia repair took the driver out from behind the wheel for any reason, then he must have a new DOT physical to resume driving. I have copd my blood oxygen level runs about 95 to 98 will I still pass a physical? You should not have any issues as long as the condition is under control and not progressing. There may be further testing required if you are demonstrating other pulmonary issues. No. You will need to have an emergency inhaler handy at all times, just in case. But asthma is not an outright disqualifier. What is the state of Kansas’s stand on defibrillators? I don’t have an answer, as we focus at a Federal level and each state has different regulations at the state level. Check with the Kansas DMV on this issue. In and of itself, this condition is not a disqualifier. If you are going to have it repaired, please be aware that you will need to be fully recovered before returning to driving. Good Luck. Does having asthma disqualify you? Not as long as you have an emergency inhaler at hand at all times, while driving. The condition isn’t the problem, it’s the potential to be a safety hazard if you can’t breath correctly. So the condition isn’t the issue, it’s the operation of a CMV being interfered with due to an asthma attack. Oh and Ernie, this was all new to me until I got to the doctor, go prepared so you won’t have to deal with time issues like I am. YOUR CONDITION IS A FACTOR. If they see smoking, asthma, shortness of breath, or medications listed they WILL BE ASKING NOW. And you will be sent home to get tested. So do it now and get the bad or good news before you have to worry. This is brand new and I was upset and shocked. Well guess what it can, depends on your spirometry results, and guess what I am dealing with low results right now, new Federal rules have guidelines and yes if this test fails, you can get Blood Gas and Pulmonary function test like I will be doing tomorrow to hope for a better result so I WON’T LOSE MY CDL ENDORSEMENTS. Brand new rules require the doctor to see results now, if have any breathing issues at all BEWARE. And the inhaler isn’t even a part of it like Trucker Doc says, the results must comply with levels dictated in new rules. I KNOW AM DEALING WITH THIS AS WE SPEAK, This is why I am on here. So get tested and get the info so you know what you are up against, you can get treatments to make it better of course. But I cannot afford not to work while this happens. @deb hi so how did your test go? Is there any helpful tips you can give me before I take my breathing test.. I am going for my pet today. They will not even start my physical until I have my results. This is a new federal requirement. I’ve been driving trucks for 29 yrs and I can not afford to to not work. How someone who is grossly overweight can pass a physical while I have to jump through hoops is ludicrous. The issues you are dealing with have some limitations as far as the FMCSA is concerned. You did not give me any information regarding time frames, and that’s OK.
Just operate with these rules and you should be alright. For both of the conditions you have, you should get a medical release form completed by your primary healthcare provider. With those forms completed and in hand when you go for your medical card, you should be able to answer any questions that the CME medical examiner has. If there is some type of lung insufficiency, and he feels that there may be a problem, then he may require a lung capacity test. That being said, unless he is a certified lung specialist, then you should be referred to your primary healthcare provider. If a person smokes, is it REQUIRED that the doctor give a pulmonary test or was the doctor out to get an extra $35? Maybe just doing a through examination. If the examiner felt there was a question about your ability to breathe then he/she was just doing a complete job. It isn’t required, but he/she must confirm any questions he/she may have in this regard. The same thing happened to my husband today, The Dr. says lungs are clear, and marked on the physical form that all was good. No problems. My husband didn’t know any better and the charge was an additional $42.00. My question is – Is there an updated law that so states that you have to have this Pulmonary function test just because you smoke, and are 45 years old, etc.? It is not a mandatory examination, but if the CME feels that there is a need for the examination, he can request it. But some facilities are taking advantage of a situation that does not exist in the FMCSA guidelines and there is no mandatory test protocol. This question is too broad for a single answer. When the DOT examiner is going through the examination, he is looking for a driver who is medically fit to operate a CMV. If you qualify then away you go. If not, he will discuss what the challenges are and what other avenues you might pursue.